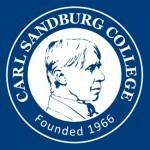 Carl Sandburg College students have a new place they can go on campus to unleash their creativity. The Galesburg Area Chamber of Commerce held a ribbon cutting for the area last week with various elected and college officials. The MakerSpace is dedicated to creating, building and idea generating. The space has many potential uses from a classroom, a meeting space, or a unique environment to prepare presentations, test out theories as well as individual and small group learning. The MakerSpace has dry erase walls, tables and windows a 3-D printer, laser printer, SmartBoard and basic supplies for a poster presentation. The college is using MakerSpace to utilize things they had but weren’t being utilized to their full potential according to Claire Erlich, Coordinator of Library Instructional Services. College President Dr. Seamus Reilly says the space is great because of its combination of technology and tactile learning. He says “we know young people are very creative and want to use their hands” and MakerSpace is an environment that encourages that. The room also has what they call a “Breaker Space”, with old computers that can be taken apart to see how they made and work. The space is also open to the community.